Investing may seem complicated. But it really isn't once you realize that most of what you need to know can fit on a fairly small list. 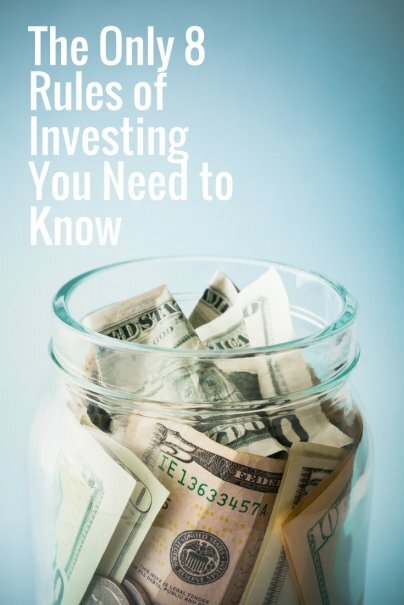 No matter what your investing goal, you can make money just by following some simple rules. Here are eight rules that will get you on the path to investing success. It's very simple. The more you invest, the more you end up with over time. The stock market's S&P 500, which tracks the performance of the largest American companies, averaged a 7.25% annual return between 2006 and 2015, according to figures tracked by New York University's Stern School of Business. And it's averaged more than 9% annually since 1928. You won't get better returns on your money anywhere else. Even small increases in your investment contributions can make a big difference. A $5,000 annual investment would turn into $74,000 in 10 years, based on a 7% return. A $6,000 annual investment would be worth $88,000. A $7,000 investment would become $103,000. One of the most important things to know about investing is that the earlier you start, the more you'll end up with in the long run. There are many people who don't start investing for retirement until very late in life, and they end up with a far smaller nest egg than they first imagined. That's because they were unable to take advantage of the phenomenon of compounded returns. Let's say that you begin saving for retirement at age 40, putting aside $1,500 monthly. Assuming a 7% annual return, by age 60, you'll have about $789,000. But if you started at age 30, you'd end up with $1.8 million after the same period. Start at age 20, and it's a very comfortable $3.84 million. The stock market is volatile by nature, but as we indicated above, it generally trends upward over time. If you invest with a short time horizon of less than three years, you may not make any money at all. In fact, you might lose quite a bit. But if you extend your horizon to 10, 20, or 40 years into the future, you'll enjoy solid gains on an average annual basis and see the volatility smooth out. You may think you have a good sense of precisely when the markets will go up and when they'll go down. But chances are, you're guessing just like everyone else. "Timing the market" is not something the average investor can successfully do on a regular basis. It makes much more sense to invest a set dollar amount during regular periods, usually monthly or quarterly. This is called "dollar cost averaging," and it works for investors because you end up buying more shares when prices are low and fewer shares when prices are high. If you're focused on retirement — and you should be — there are great advantages to opening 401K and individual retirement accounts, due to tax laws that encourage people to save and invest. With 401K plans offered by your employer, any contributions you make are deducted from your taxable income. With a Roth IRA, your investments grow and you pay no capital gains tax when you withdraw your money when you retire. A 401K lets you deposit up to $17,500 annually. A Roth IRA allows up to $5,500 in annual contributions. If you can max these out, you'll be in great shape. There are other tax-advantaged vehicles, including 529 college savings plans and Coverdell accounts, which allow you to invest money without giving as much to the Internal Revenue Service. In some cases, money can grow tax free and you get a tax credit on top of that. Use these accounts, and your overall investment returns will be higher. There's no exact consensus on the ideal investment mix, but most financial advisors suggest investing in nearly all stocks and index funds when you're young, because you're a long way from retirement and can make up and money you lose during down years. As you get closer to retirement, gradually shift your portfolio to include less volatile investments like cash and bonds. It's fun to own shares of individual companies, and buying a few shares of a company you like is a good way to get started in investing. But trying to build a balanced portfolio of companies is very hard, and there's very little evidence that human beings are capable of "beating the market" on a regular basis. That's why for most investors, it's sensible to invest in mutual funds or exchange traded funds that mirror the performance of the overall stock market. This is called "indexing," and it's a surefire way to make money over time without the volatility of owning individual company shares. When investing in mutual funds or exchange traded funds, take a hard look a something called an "expense ratio." That's the amount of money that the mutual fund company takes before you even see a dime in returns. These expenses range from well above 1% to a minuscule .05% by some brokerage houses. One percent may not seem like much, but it can definitely cut into your returns and cost you thousands of dollars over time. Mutual funds that are actively managed, rather than those that simply track an index, generally have higher expense ratios. Keep in mind also that there may be fees every time you buy and sell. Discount brokerage companies will charge between $6–$10 for every transaction. That can add up if you do a lot of trading. Any rules we've overlooked? Share with us in comments! Nice list. Thank you. What about compounding and DRIP (dividend reinvestment)?